In all honesty, The False Prince contains nothing within it to warranty such a low rating – its writing is easy to read, its pace is swift, and the plot is a page-turner. 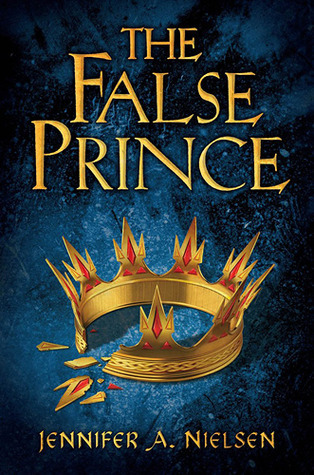 In fact, to many readers, The False Prince will no doubt be a breath of fresh air – something new, unique, and original in the genre of fantasy. However, to me (and I’m sure numerous other older readers), The False Prince is nothing but a disappointing rip-off of Megan Whalen Turner’s The Queen’s Thief Series. When Sage, gifted thief and orphan, finds himself saved from an unsuccessful bout of thievery by a nobleman, he does not expect to find himself in grave danger - but he is. Carthya, the kingdom in which Sage lives in, is in peril due to the sudden assassinations of its king, queen, and crown prince. Jaron, the youngest prince of the kingdom, perished four years ago in a pirate raid and his body has been missing ever since. Thus, to save the kingdom from certain corruption, Lord Conner plans to train three orphans with an uncanny similarity to Prince Jaron and use them to take over the throne of Carthya. Sage does not want to be king and he wants nothing to do with Lord Conners treasonous plans, but to not be chosen as the false prince is a sure ticket to death. When I first finished The False Prince I was unable to summon up much feeling or emotion for it at all. First and foremost, the plot was predictable - too predictable. It is evident even from the synopsis who the chosen prince will be and the supposedly devious tricks to make you doubt yourself and think otherwise failed to dupe me. Furthermore, there is a huge plot twist towards the end of the novel regarding Sage himself. Unfortunately, this was yet another secret I had figured out less than half-way through the story. I don’t think younger readers will be able to guess these turns as easily as I was, but it detracted from the overall reading experience for me. Yet, I think I could have still forgiven The False Prince of its predictability if it had not been for the characters themselves. Sage, our protagonist, is almost exactly like Eugenides, the clever thief of Turner’s Queen’s Thief Series. Now, you’d think I’d be thrilled and excited to read a story with a slightly different plot line featuring a character I love, but that isn’t true. Sage, for all his trickery, thievery, and deceitfulness, is nothing like Gen. In many ways, I find it hard to describe Gen’s character which is part of why I love him so much. I also love him because he is a hero and he doesn’t even realize it himself. Turner manages to write Eugenides, who is an immensely complex character, in such a manner that she never tells us he is a hero – in fact, she portrays him as petulant, childish, and clever – yet we are able to glean through his actions, betrayed emotions, and heart that he is. Sage on the other hand, is simply a petulant, childish, and clever character. He lacks the true depth of emotion that Eugenides had, he lacks the older generation wit and sarcasm that Gen possessed, and most of all, we are made to believe Sage is a hero because the author tells us, thus utterly distinguishing himself from Eugenides. While I appreciated Neilson’s efforts to write a character much like Gen himself yet differentiate him at the same time, Sage lacked the qualities that made Gen truly spectacular. Thus, since it was Sage’s narration we read throughout the novel, it was ultimately disappointing. Furthermore, Sage’s feelings and emotions towards not wanting to be a king were conveyed so blatantly that they lacked the poise in which Turner showed us how tortured Eugenides felt to be taking the role of king. In many ways, The False Prince is simply a less complex and flatter condensation of Turner’s first three novels rolled into one with a slightly different plot. In my opinion, a novel which derives itself so closely from another fails to do anything positive in my mind. Wimbledon, New York, Melbourne and France. If it's breached, you'll probably die down there. Laguna Fertilizer Sticks - Individual. so, are you advocating that I get over my squeamish attitude and use it on my potatoes? I did notice my potato plants are becoming a little yellow green. You can also save money and make your own organic lawn fertilizer.